The Bathroom Partition Panel Bracket Kit, we have seen the light. We used to sell Bathroom Partition Panel Brackets individually, and we still do, but now we offer the Bathroom Partition Panel Bracket Kit. Purchasing these packages is now just one click away. 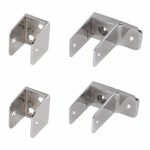 The Bathroom Partition Panel Bracket Kit is for use on powder coated steel and plastic laminate restroom stall panels. The panels are what divide the stalls and are mounted to the wall and the pilaster post. We usually find the one and two ear brackets mounted on the wall, and the “U” brackets mounted to the pilaster. The panel along with the headrail provide the rigidity to the compartments. 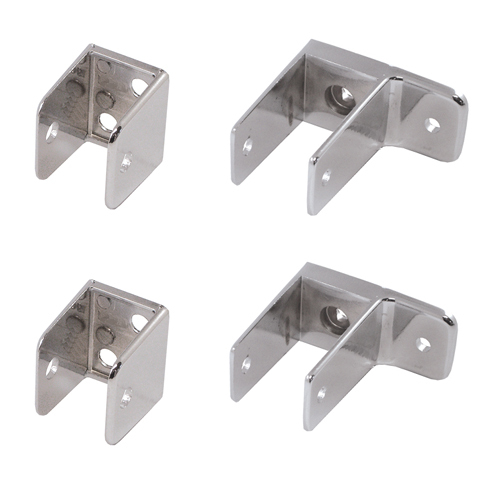 Each Bathroom Partition Panel Bracket Kit includes all the hardware to mount one restroom panel. The packages include two “U”, and two either One Ear or Two Ear Brackets depending on the package you choose. A One Ear Bracket has one mounting hole off to the side of the piece. The Two Ear Brackets have an ear on both sides of the bracket. The components are made of Zamac die cast metal that is then chrome plated and polished. Each kit also includes the eight wall anchors, eight one way sheet metal screws, eight machine screws and eight barrel nuts. The screws are the tamper proof one way type. Bathroom Stall Panel Kits are an easier way to purchase the hardware you need. We are currently offering the Bathroom Partition Panel Bracket Kit for 3/4″ thick and 1″ thick panels. If you have a different thickness panel, or are looking for help or advise, our Toilet Partition experts are here to help.